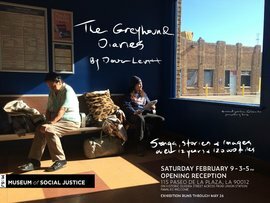 Over 12 years and 120,000 Greyhound miles, Doug Levitt '93 has written songs and stories and has created photographic images of fellow bus riders. Inspired by Depression-era projects, he has performed at a range of places from VAs, shelters, and prisons to the Kennedy Center, Woody Guthrie Center and Southern Poverty Law Center. Prior to the Greyhound Diaries project, Levitt was a London-based foreign correspondent, working in places such as Iran, Bosnia, Rwanda and Gaza. He was a Fulbright scholar, earning a master’s degree in Nationalism and Ethnic Conflict from the London School of Economics. The opening reception is Saturday, February 9, but the exhibition, at the location of L.A.’s origins, runs through May 26. Date: Saturday, Feb. 9, 2019 reception with Levitt, who looks forward to meeting fellow alumni. For general info about the Cornell Club of Los Angeles or questions about using the Cornell Club of Los Angeles website, contact our Administrative Secretary, Nancy Mills, at (310) 545-3321 or nlm5@cornell.edu.